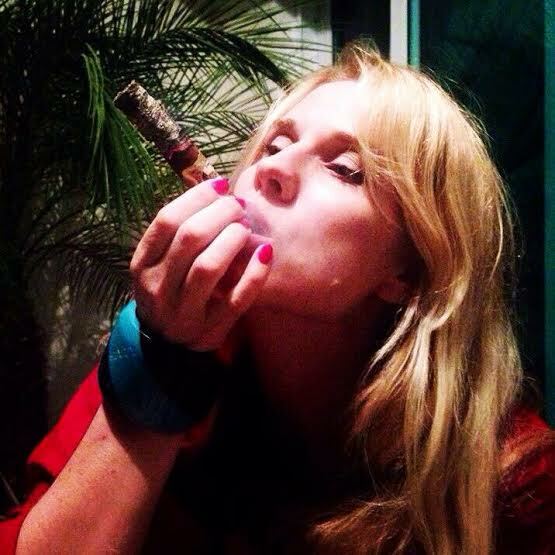 MB Cigars Ladies adds a new lady, a professional ones. Please read the interview, I found it very interesting. It was gradual. The first time I tried a cigar was with friends at a High School Senior party (I was just turning 18 years old), a couple of friends and I shared a Montecristo No. 2. That was in Budapest, Hungary, which was where we lived during my teens. I was not impressed… It felt too harsh. A Cuban Montecristo is in fact smooth and creamy and a good medium plus in body, but maybe I was too young, or most likely the cigar was not of good quality and maybe not aged enough. My father was in the management team of Swedish Match ever since I was 8 years old so tobacco was no stranger to me… I didn´t smoke cigarettes but I sometimes tried to puff some cigars once in a while but not often. So when I really started smoking cigars I was 25 years old. 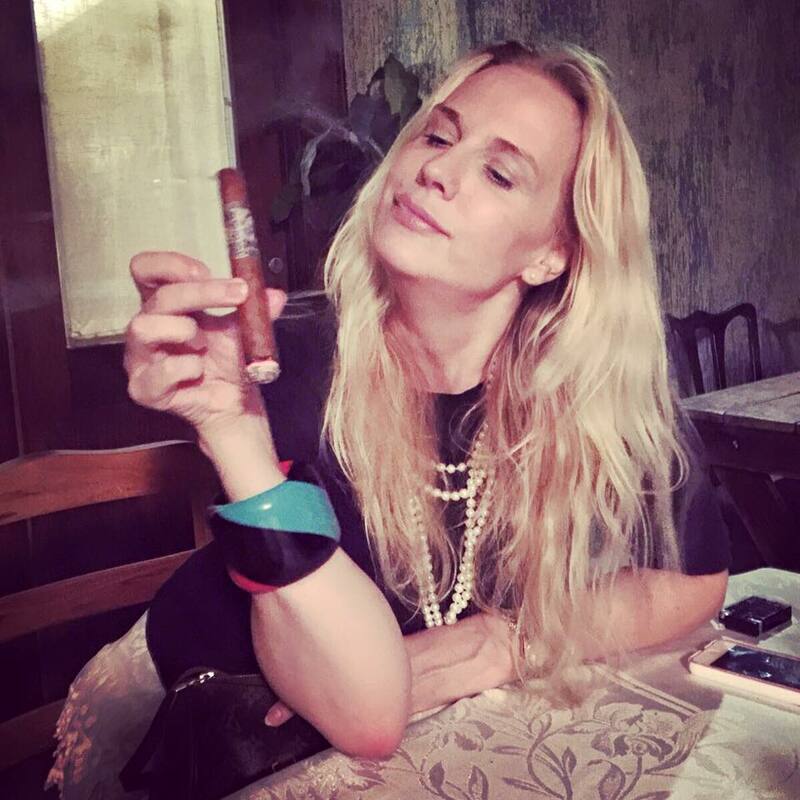 I was working for the premium cigar lines of Swedish Match (General Cigar) so with work, events and seminars I was smoking more and more…. I was being trained in premium tobacco and the more I knew about this beautiful product the more I enjoyed smoking premium cigars. With my profession it was completely natural… There is no “why,” it was simply natural to do so. I don´t smoke every day. I smoke I would say three to four days a week. However, during business-trips and event-weeks I definitely smoke every day and then two to three cigars per day. Also, during the process of blending a new cigar, whether Jose Blanco blends, or in the case of Freyja which I blended, then I smoke a lot in one day and every day from Monday to Friday, work-days in the factory. However, during blending it´s difficult to say how many cigars smoke because then I smoke pure grade tobaccos and test blends… Sometimes I just test 4-5cm of one blend if it is completely off, but if another blend is truly great I will smoke the whole cigar… and so on… But in circumstances of no blending, marketing and sales business at the office (well I work from home) and when there are no business-trips or events, then I smoke one cigar per day and only about three times a week. 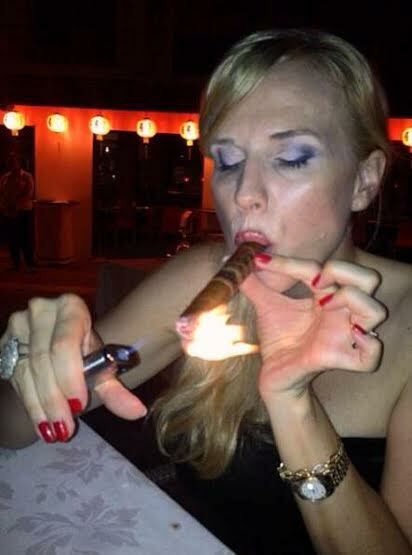 But there are exceptions: last night I went out to dinner with friends and smoked two cigars. The best place I have smoked a cigar… I would say two places: First is at a cigar-factory with all the premium tobacco aromas around me, the sound of the chavetas or walking through fermentation-bales… The other great place for is on a boat at sea, everything at sea is just wonderful for me! I like a simple classic double guillotine cutter. A V-cut is also interesting and gives a good draw for me, but in this case I´m a classic girl and I like a classic clean cut. As seen above, it all depends on why I´m smoking: during blending I am extremely concentrated and I concentrate on every single note, taste, aroma, stimulation on every mm of my tongue and palate, in the nose on the retrohale – deep concentration and analyzing. I am also very much into details so in this case that care for details manifest. Any other time that I smoke, I also think deeply into the flavor, aroma, complexity, retrohale, stimulation, but in a more relaxed way of course… I like how a cigar feels in my hand, it is fully a wonderful experience with much stimulation. The cigar itself helps the athmosphere as much as the athmospher helps the cigar. Again this depends… When I go to the factory in the morning that´s when I light up, aroud 9 in the morning with water and just a little bit of coffee. At home I prefer a cigar at the end of the day after a day of hard work, it is then very relaxing. I will not mention brands or manufacturers because being in the industry I don´t like to pick favorites. Also, if I choose some cigars then tomorrow morning I will wake and remember “Oh and that cigar! And that one!…. !” Etc… But I like many different origins of premium tobacco and many different brands. Yet all in all I love first of all spice in a cigar, that spice that tingles inside the lips and that also manifests in the notes on the retrohale. On the other hand, I prefer when the strength and spice in the nose smooths out and doesn´t stay there too long. Second. I love creamy sweetness such in many well-constructed Cubans and I also love rich sweetness such like a dark chocolate kind which for example shows a lot in a Mexcian San Andres leaf. I need complexity and growth in a cigar to keep my mind busy and interested in what comes next. In body, I like a full body in actual “body” or “flavor-body,” yet in strength I like a medium to full body, sometimes a full one too but not the extra strong ones. In sizes, I prefer thin ring gauges from a 38 Lancero to a classic 42 Corona…. I choose to not smoke over a 52 ring gauge, although a 54 Toro happens but very seldom. Mostly I moke Corona or Robusto or a Lancero if it´s available. In my line Freyja, I have a Pyramid, I love it! This Pyramid is a 6 and a half inches long cigar that starts off with a 52 ring gauge and grows thinner and thinner… and it really grows in profile. Last night I smoked a Freyja Pyramid and the nub was around a 40 Ring Gauge and extremely rich, the growth from 52 to 40 is a wonderful smoking road! It was a real pleasure to read the inteview Emma. Thanks fot your time spending to do the interview. Good ashes. 2 Responses to "“Emma Viktorsson„"
Emma has matured into a consummate master of the industry. 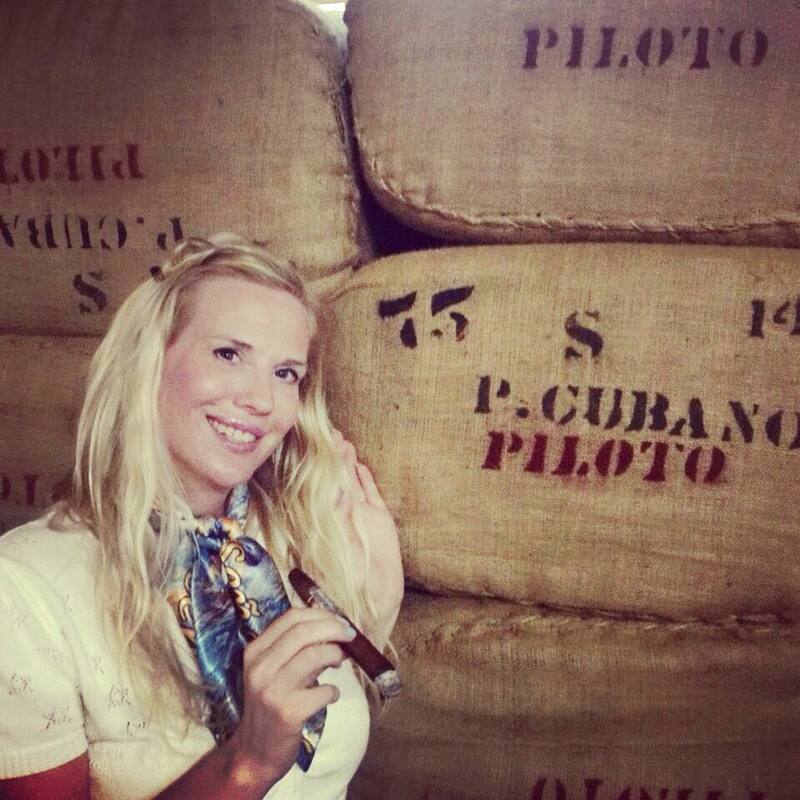 Her attitude and dedication to perfection is a breathe of fresh air to those of us that are tired of one dimensional cigars. I look forward to decades more of her achievements for my pleasure in cigars.